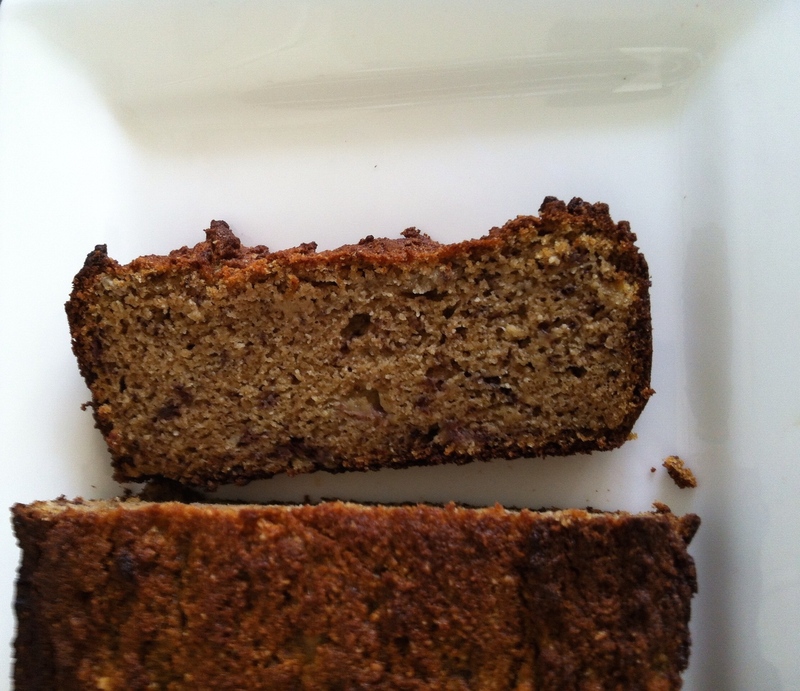 Mid week and I’m thinking that some tasty Banana and Coconut bread will get me through to the end of the week. I first posted this recipe about six months ago, so it’s time to make it again. Hide this bread as soon as it comes out of the oven, or it will suddenly disappear! Giving up grains and refined sugar I thought that cakes and bakes were a thing of the past – the old eating. Way too much sugar, not to mention all that wheaty flour; boy was I so wrong! Baking has now become an interesting challenge. When you work with grain your results are generally pretty predictive. Mix this and this to get that. But working with nut flours and heaps of eggs is a whole different ball game however the result is even better than the food baked the old way. 1/2c (125g) melted butter – or use melted coconut oil to make this Dairy-Free! Line with cooking/parchment paper a small loaf tin 10.5 x21.5mm (4 x 8.5in). Combine dry mix ingredients and stir together to smooth any lumps. If you are using coconut sugar instead of honey add this now. Whisk the wet mix – eggs, honey- if you are using this and vanilla to combine well. Stir in the mashed banana. You can mash these until smooth or leave a few lumps of banana if that is how you like it. Combine all this with the dry mix. Lastly stir in the melted butter (or melted coconut oil). Tip the batter into the loaf pan and smooth the top. Place in the oven for around 35 mins – though check after 25mins using a skewer which should come out clean if the loaf is cooked. Remove from oven, cool slightly in the pan then place on a wire rack to cool for 15 to 20 minutes. Place on a bread board and use a serrated bread knife to gently slice. Smear with butter, cream cheese or if you are dairy-free, what ever takes your fancy and enjoy. Note that the loaf will be a little lighter looking if you use honey. This is also a great desert – slice carefully when the loaf is still hot and serve with whipped cream. This looks awesome! I need this to get me through the week! Yes – I’m with you there!